Blitz Games: Kinect Detractors Lack "Vision"
Blitz Games Chief Technical Officer Andrew Oliver says people who have been critical of the Kinect motion controller for the Xbox 360 just "don't have a vision." Kinect, despite Microsoft's best marketing efforts, sometimes seems to have more than its fair share of detractors. Concerns have been raised about its price, its relevance to the core Xbox audience, technical limitations and even a lack of interest among developers. But Blitz Games is with the program and Oliver suggested that people predicting doom and gloom simply refuse to see its potential. "They don't have a vision," he told Edge. "You have to see it up in front of people, and they play with it, and they have fun - it's exactly what happened with the Wii, but this takes it even one level further." Blitz's recent catalog includes titles like Karaoke Revolution Presents: American Idol, Bratz Girls Really Rock, iCarly and All Star Karate, so it's not exactly a big-name, cutting edge studio. But it does know a thing or two about making games that strongly appeal to very specific demographics and Oliver said that for some games, like the upcoming "movie karaoke" game yoostar2, motion-sensing controls are simply a better way to go. "It's up to the software designers to make it obvious what you're doing. [yoostar2 is] a mirror, but behind you is going to be a famous scene and it's up to you to speak the line - so make the concepts easy," he explained. "You'll never get that from the controller. There will always be, 'You need to press this button, you need to press that button, you need to do this action'. And fundamentally, that's a bit of a blocker for a lot of people - they just instantly turn off." 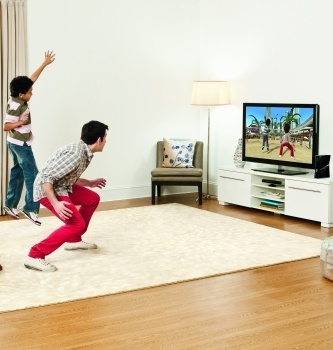 Kinect hits store shelves on November 4.